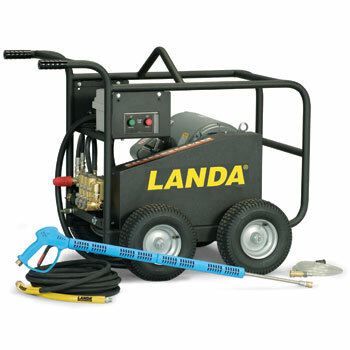 Landa HD GasSeries Cold Water Pressure Washer - corrosion-resistant aluminum, cold water pressure washers that easily convert from a cart to a skid. These gas units deliver up to 4.0 GPM at 2700 - 4000 PSI and offer reliable Honda engines, a bypass loop for additional pump protection, a belt or direct-drive pump backed by a 7-year warranty and flat free tires. All these units are certified to UL and CSA safety standards. 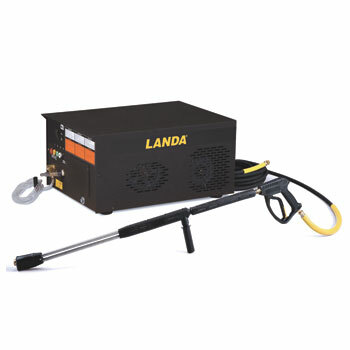 Landa HD Series Gas Skid Series Cold Water Pressure Washer - mild steel skids for the HD Series Gas cold water pressure washers. These skids are offered in two configurations: either a 50 gallon water tank and a 100 foot hose reel, or two 100 foot hose reels. Offering ultimate portability and usability, these skids fit within a standard UTV / ATV bed. Landa MP Series Cold Water Pressure Washer - capable of tackling a variety of cleaning applications, these gas or diesel powered cold water pressure washers are built with a high-impact 10-gauge steel chassis and rugged roll cage coated in weather resistant powder coat paint. 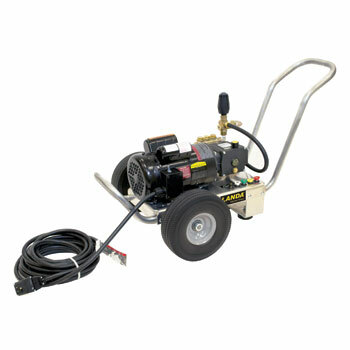 They deliver up to 4.5 GPM at 3000 - 5000 PSI and are engineered to remove stubborn dirt and debris from surfaces. 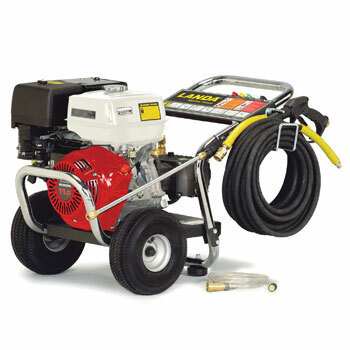 These portable power washers feature either a Honda or Kohler engine, 5-gallon fuel tank and a belt-drive Landa pump backed by a 7-year warranty. All these units are certified to UL and CSA safety standards. 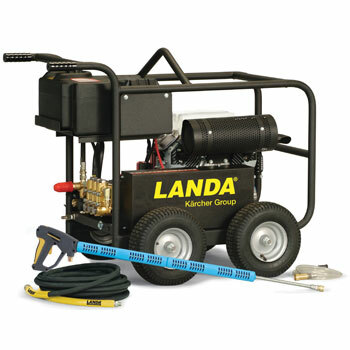 Landa PG Series Cold Water Pressure Washer - gas powered cold water pressure washers engineered to remove stubborn dirt and debris from surfaces. These units deliver up to 4.7 GPM at 2000 - 4000 PSI, and built with a rugged 10-gauge steel chassis protected with weather resistant powder coat paint. 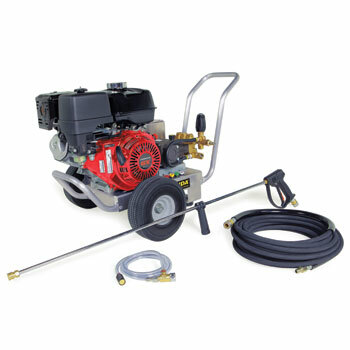 These cold water pressure washers feature either a Honda or Vanguard engine, 2 spring-loaded rubber pad feet to prevent unit from walking and a belt-drive Landa pump backed by a 7-year warranty. All these units are certified to UL and CSA safety standards. 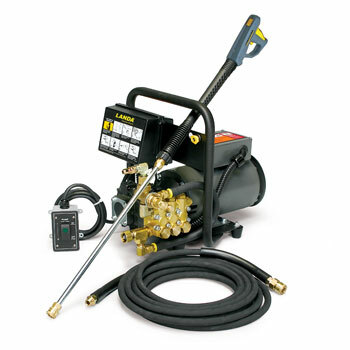 Landa PC Series Cold Water Pressure Washer - gas powered cold water pressure washers are among our most popular machines for everyday industrial use. These power washers feature reliable Honda or Vanguard engines, shock-absorbing rubber feet to prevent unit from walking and a direct-drive Landa pump backed by a 7-year warranty, and they are built on a rugged 10-gauge steel chassis protected with weather resistant powder coat paint. Engineered to remove stubborn dirt and debris from surfaces, these portable cold water units deliver up to 3.8 GPM at 2400 - 3500 PSI and are certified to UL and CSA safety standards. 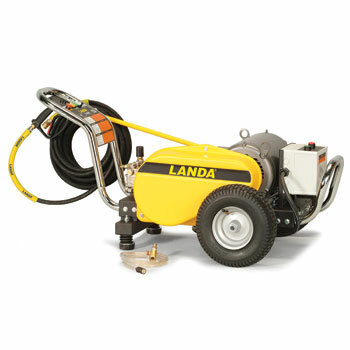 Landa HD Electric Series Cold Water Pressure Washer - corrosion-resistant aluminum, cold water pressure washers that easily convert from a cart to a skid. Engineered to remove stubborn dirt and debris from surfaces, these electric units deliver up to 3.5 GPM at 1000 - 2000 PSI. They feature a VRT3 unloader with a bypass loop for additional pump protection, a 7-year warranty on their Karcher pump and flat free tires. All these units are certified to UL and CSA safety standards. 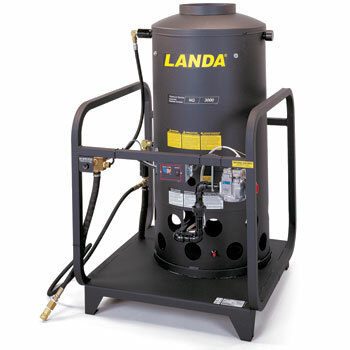 Landa Series PE Cold Water Pressure Washer - industrial-duty, these cold water pressure washers are manufactured with a durable 10-gauge, steel frame with welded seams and coated in a weather resistant powder coat paint. These electric power washers feature a stainless steel point and shoot wand, 2 spring-loaded rubber feet pad to prevent unit from walking and a belt-drive Landa pump backed by a 7-year warranty. Engineered to remove stubborn dirt and debris from surfaces, these units deliver up to 4.8 GPM at 1000 - 3000 PSI. All these units are certified to UL and CSA safety standards. 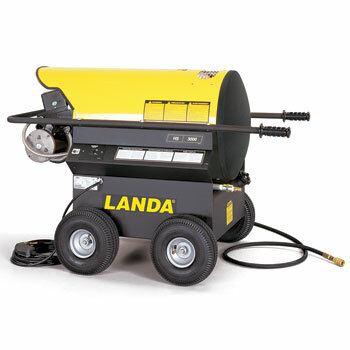 Landa SEA – Stainless Steel Series Cold Water Pressure Washer - electric powered pressure washers are stainless steel cabinets that deliver up to 4.2 GPM at 1000 - 3000 PSI to remove stubborn dirt and debris from surfaces. These cold water power washers feature an insulated variable pressure wand, 50’ hose, time delay shutdown, and a belt-drive Landa pump backed by a 7-year warranty. All these units are certified to UL and CSA safety standards. 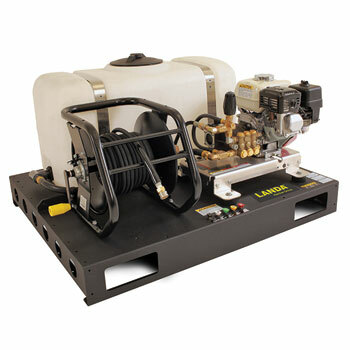 Landa SEA – Mild Steel Series Cold Water Pressure Washer - a mild steel cabinet powered cold water pressure washers engineered to remove stubborn dirt and debris from surfaces by delivering up to 4.2 GPM at 1000 - 3000 PSI. These electric power washers feature an insulated variable pressure wand, 50’ hose, time delay shutdown, and a belt-drive Landa pump backed by a 7-year warranty. All these units are certified to UL and CSA safety standards. 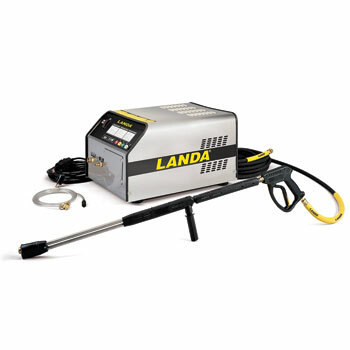 Landa MPE Series Cold Water Pressure Washer - portable and rugged cold water pressure washers built with a high-impact 10-gauge, steel roll cage, lifting bar and flat free tires are engineered to remove stubborn dirt and debris from surfaces by delivering up to 5.0 GPM at 5000 PSI. These electric power washers offer a belt-drive Landa pump backed by a 7-year warranty and are certified to UL and CSA safety standards. 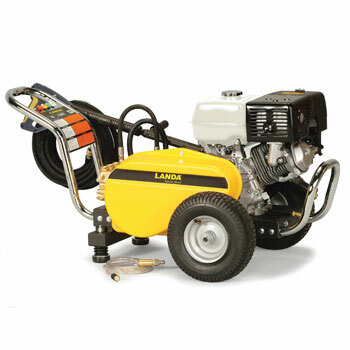 Landa ZE Series Cold Water Pressure Washer - electric powered cold water pressure washers engineered to remove stubborn dirt and debris from surfaces. These units deliver up to 2.0 GPM at 1000 PSI, and are built with durable steel frames. They feature a direct-drive pump backed by a 1-year warranty and are certified to UL and CSA safety standards. 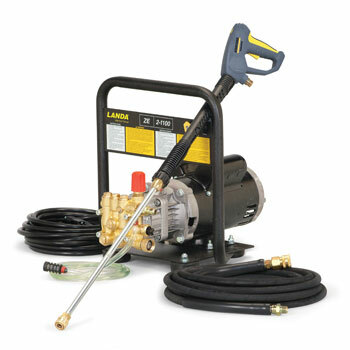 Landa ZEF Series Cold Water Pressure Washer - a quiet, electric powered, cold water pressure washer that can be mounted high on a wall away from back spray offers a 10 inch electrical cord and auto start / stop. It delivers 1.8 GPM at 1400 PSI and is built on a durable steel frame. These cold water units come with a direct-drive Landa Karcher pump backed by a 7-year warranty and are certified to UL and CSA safety standards.